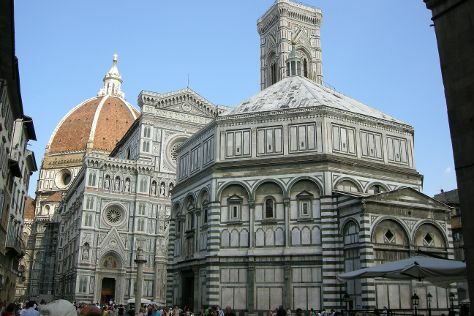 Get some historical perspective at Cathedral of Santa Maria del Fiore and Palazzo Vecchio. There's lots more to do: explore the world behind art at Uffizi Galleries, snap pictures at Ponte Vecchio, make a trip to Piazzale Michelangelo, and contemplate in the serene atmosphere at Campanile di Giotto. To see where to stay, more things to do, ratings, and tourist information, read Florence trip itinerary planner . Cape Town, South Africa to Florence is an approximately 17.5-hour flight. You can also do a combination of flight and train. The time zone difference when traveling from Cape Town to Florence is minus 1 hour. In January, Florence is cooler than Cape Town - with highs of 13°C and lows of 3°C. Finish your sightseeing early on the 12th (Thu) to allow enough time to drive to Siena. Kick off your visit on the 13th (Fri): make a trip to Centro Storico di Siena, make a trip to Fonte Gaia, don't miss a visit to Piazza del Campo, take in the architecture and atmosphere at Siena Cathedral, then steep yourself in history at Battistero di San Giovanni, and finally stop by Siena Tartufi (truffle hunting). On the next day, contemplate in the serene atmosphere at San Francesco, do a tasting at Cantina in Piazza, then pause for some serene contemplation at Basilica di San Domenico, and finally pick up some new kitchen skills with Tenuta Torciano Vineyards. To find more things to do, other places to visit, traveler tips, and tourist information, read our Siena trip website . Traveling by car from Florence to Siena takes an hour. Alternatively, you can take a bus; or take a train. January in Siena sees daily highs of 15°C and lows of 3°C at night. Finish your sightseeing early on the 14th (Sat) so you can drive to Bologna. Get some historical perspective at Basilica - Santuario di Santo Stefano and Piazza Maggiore. Venture out of the city with trips to Vignola (Rocca di Vignola & Massaggio Californiano). There's much more to do: contemplate the long history of Basilica di San Petronio, get outside with Torre Prendiparte, explore the different monuments and memorials at Cimitero monumentale della Certosa, and join in the after-dark buzz at Caffe Rubik. To see reviews, more things to do, and other tourist information, you can read our Bologna journey planner. You can drive from Siena to Bologna in 2 hours. Alternatively, you can do a combination of bus and train; or take a bus. Plan for little chillier temperatures traveling from Siena in January, with highs in Bologna at 9°C and lows at 0°C. 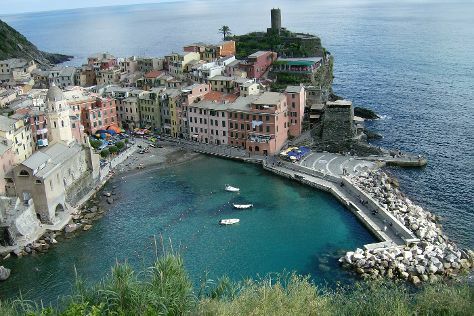 Finish your sightseeing early on the 17th (Tue) to allow enough time to drive to Cinque Terre. Kick off your visit on the 18th (Wed): learn about winemaking at Cantina 5 Terre, then learn about winemaking at Terra di Bargon, then stroll through Cinque Terre Trails, and finally take in the architecture and atmosphere at Santa Margherita di Antiochia Church. To see photos, more things to do, other places to visit, and other tourist information, you can read our Cinque Terre trip itinerary planner . Traveling by car from Bologna to Cinque Terre takes 3 hours. Alternatively, you can take a bus; or take a train. In January, Cinque Terre is a bit warmer than Bologna - with highs of 13°C and lows of 3°C. Wrap up your sightseeing on the 18th (Wed) early enough to travel back home.